所需要的材料如下：鲜奶1公升，酸奶2汤匙酸奶（优格乳）当菌种，不锈钢容器及汤匙。 （All you need are : 1 Liter of Pasteurized Fresh Milk, 2 tbsp of Plain Yogurt, a S/Steel Container & a Spoon. 1. 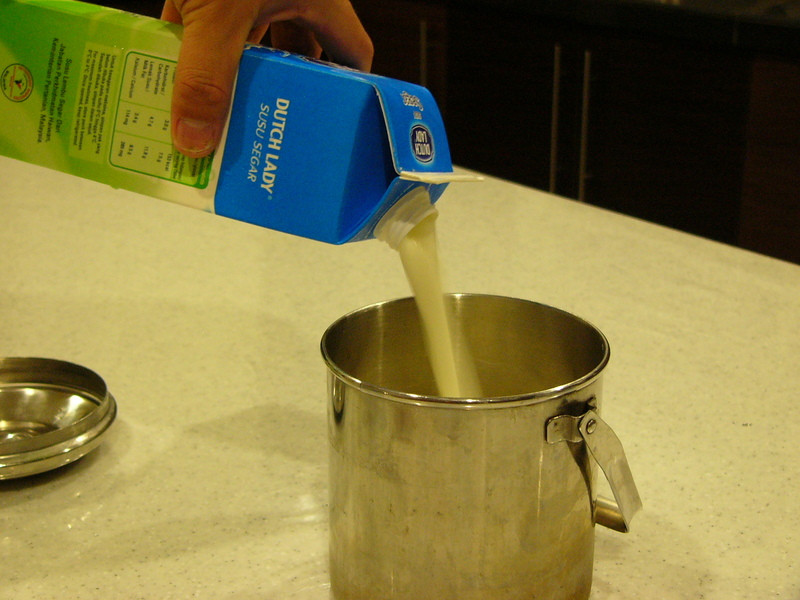 Use pasteurized fresh milk. 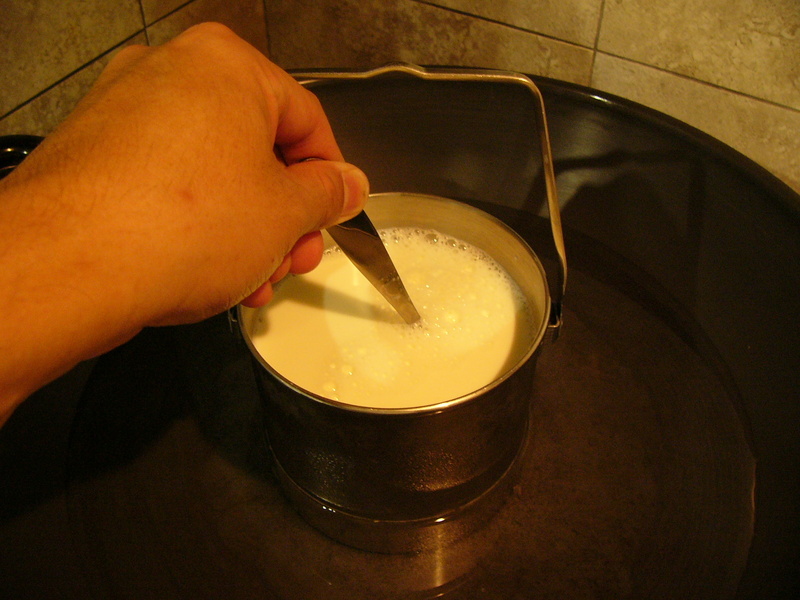 If you want to use raw milk, you have to make sure you sterilize the milk completely before using. 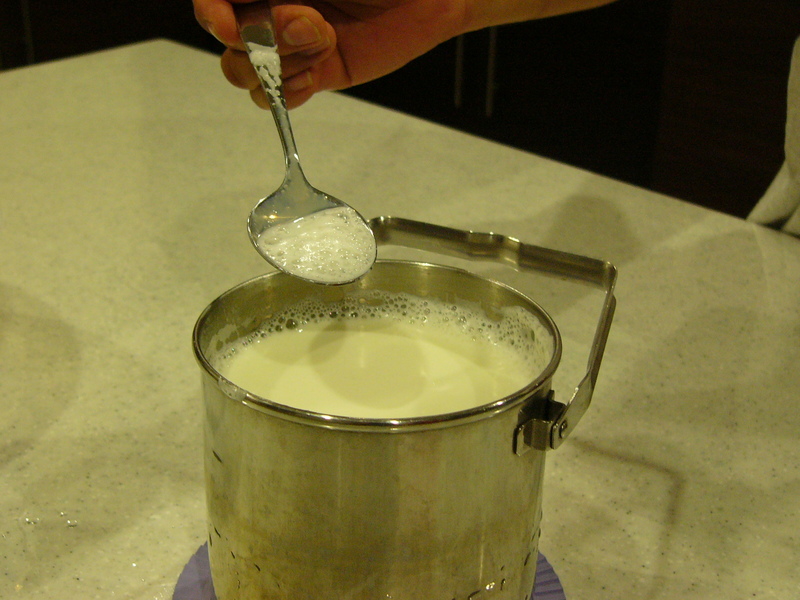 It is safer to use the fresh milk from supermarket because it has been pasteurized. 2. Full cream milk, UHT milk, high calsium milk, low fat milk or milk with fruits favor are NOT recommended. 3. Make sure all of your containers and tools are clean (no dirt and oil) and dry under sunlight before use. 4. Take special care on the hygiene issue after step 4 ,as you do not want contaminate the milk after you have sterilized it. 5. Make sure the milk is cool below 40C before you perform step 6 because high temperature will kill all the good organisms in the plain yoghurt. Also use plain yoghurt for this purpose, the use of low fat yogurt, high calcium, low sugar or yogurt with fruits favor are NOT recommended. 6. The finished product may contain some clear liquid separated from the solidified yogurt, DO NOT pour the liquid away, these liquid are nutritious by-product, you can stir & mix the whole thing together with a clean spoon before you consume. (1) The duration of the fermentation process—The longer you leave your yogurt to ferment, your yogurt will turn into more solid form. (3) The temperature — The bacteria will ferment faster in suitable temperature, if you put your yogurt to ferment in room temperature (Malaysia at night 25C-27C ) it will take slightly longer time. What you need to do is to try and error and strike a balance between these 3 factors to obtain the type of yogurt of your like. Also, some of the yogurt you make may leak whey (the watery substance) , do not pour away as these are very nutritious, Mix it back to your yogurt before you consume. Some large dairy companies rely on a faster process to produce more yogurt, but use thickeners to reduce the degree of whey leakage, try to avoid those commercial yogurt when aver possible. Lastly, no matter how your yogurt looks like, it is as nutritious as any other yogurt in the market because It has your LOVE inside, it is the best gift for your love one and I am not joking. may I know y the yogurt I made is waterly compare to yogurt at market? Dear Kim, Thanks for your Q. I have updated my post to include the answers to your Q. Feel free to comment. You are welcome, please note that even though the yogurt you have made appear watery, there is no difference in terms of nutrition content. You can add some fruit juice and it will become delicious yogurt drinks ( Lassi-Indian beverage) , I am sure you will like it, have a try and enjoy. Uuuuuhhh…. Can’t wait for my new fridge to arrive next week. Then I can try this out myself! 是这样哦 . 我是买市面上NESTLE 的 YOGURT , 也许再试试看. 谢谢! What make you think I am KULIM rang ? Thomas, can i used the yogurt maker to make yogurt as you mentioned above? i hv bought the easiyo yogurt maker , i just put in cold water and yogurt powder in a jar and stand inside the yogurt maker fill with boiling water and set for 8 hours, but that one is more expensive, RM15 for 1 kg yogurt. I wish to do the cheaper one. I have no idea, you have to try it out. ehon, y not tried the one Thomas taught here. 1 litre of Tesco fresh milk is less than RM5, 1 cup of Nestle Natural yogurt is less than RM3. Add up, less than RM8. Plus, u dun need a yogurt maker. But of coz, it’s always encouraged to try new way and share it wt us here. Unless, as u mentioned, u want to do a cheaper way. All the best trying! I have made yogurt following your instruction, each time was successful, except once when i tried using the strawberry flavoured milk(which is not recommeded, but i tried also, still edible but not so nice). My 2 yr old daughter loves the yogurt very much. 🙂 Thanks for sharing the information. I ‘m glad your daughter likes it. I am sure she will like this [Lassi] as well, you can even use banana, apple or just add in some fruits juice. when i open the container this morning at about 9.30 am…….hurray…..hurray the yogurt is successfully “born’ its look so “beautiful”although its doesn’t taste like my expectation but its tasty after blend with dragon fruit, ha ha ha happiness is just something very simple .Thomas ,thank you very much. p/s: I have bad experience with the fresh milk from 24hours sundry shop cos not fresh, maybe due to the storage temp, (hopefully it was an isolated case). Someone gave me a batch of “Kefir grains” which I had started brewing it. I knew very little about Kefir but from what I read so far, it is quite a good gut food, almost surpassing yogurt. Do you have any experience in Kefir culture? I hope to discuss with someone who have experience in Kefir brewing in our region with similar climatic condition. I do not have experience in kefir fermentation, but kefir, yogurt & enzyme are similar because they all are rich in probiotic and good for our gut. It just that yeast in the kefir fermentation may turn the end product to contain a little bit alcohol just like our enzyme fermentation. Give it a try and hope you can come back and share with us. You are right to say that Kefir will contain a small amount of alcohol, if we close the lid (as I read). What I did was, I covered the mouth of the jar with clean cloth and let it ferment for only 24hrs. The end product was a very nice, sour kefir, tasted a bit like yogurt except it is smoother and runny than yogurt. I did not taste alcohol, I knew because I have an extremely low tolerence for alcohol…Shandy can make my head spin 🙂 and so are our wonderful enzymes…hehe. I started with only a very small batch (I got only about 1 teaspn of kefir grains), so would not know its health benefit on me yet. Hopefully, the kefir grains will grow eventually to the amount I need for bigger quantity to feed my entire family. I am into the 2nd week of kefir brewing. I enjoy it very much and so are my family members. It’s very easy and one does not need to spend a lot of time doing it. Once you settle into a daily routine of harvesting and making new batch, everything just falls into its place. You just need to ensure daily supply of fresh milk. Please check this link for more info and understand the difference between Kefir and Yogurt. I understand Dom is the “king of kefir” quite famous in Autralia. Some Qs: Where to store the kefir grains if you decided to stop for a while ? In the fridge? I heard you need to activate the kefir grains if you put in the fridge? How to activate ? According to what I read, there’s a few methods to store milk kefir grain. 1. Store in fridge with some fresh milk in a jar, that could last 1 week. Strain and pour in new milk every week. To activate it, just take it out, strain and add fresh milk, let it stand outside to brew. That’s all. This little creature is very robust, but just beware of chemical exposure esp chlorine in water and metal utensils. 2. Dry it and sprinkle dry milk powder then freeze it, some say it could stay alive for 2 years but 2-3 months is recommended. It will take 4-6 days to reactivate with daily milk change as per the usual brew. You can read Dom’s website to find out more. I do not have the experience yet. I am still trying to brew daily to let the grain grow till it is enough to feed my entire family daily. I am harvesting about 0.75L now. Thomas, I remember reading a post here from someone who said that she brews enzymes with the mother culture in sugar and water for 24 hrs and harvested it. I think it could be the sugar kefir grain, what say you ? I have no experience in sugar kefir fermentation that is why cannot comment much. I know bacteria better than yeast, I know how to prevent the bad bacteria from growing but I have no idea on yeast. As far as I know, yeast is good when under controlled , but too much yeast is bad. Yesterday night i try to make the 2nd time of D.I.Y. Yogurt. Both time also success! I like the taste & I make the apple lassi for my family, they like the lassi drinks so much. Thanks a lot to Mr Enzymo. I will share this wonderful D.I.Y Yogurt with my friends also. 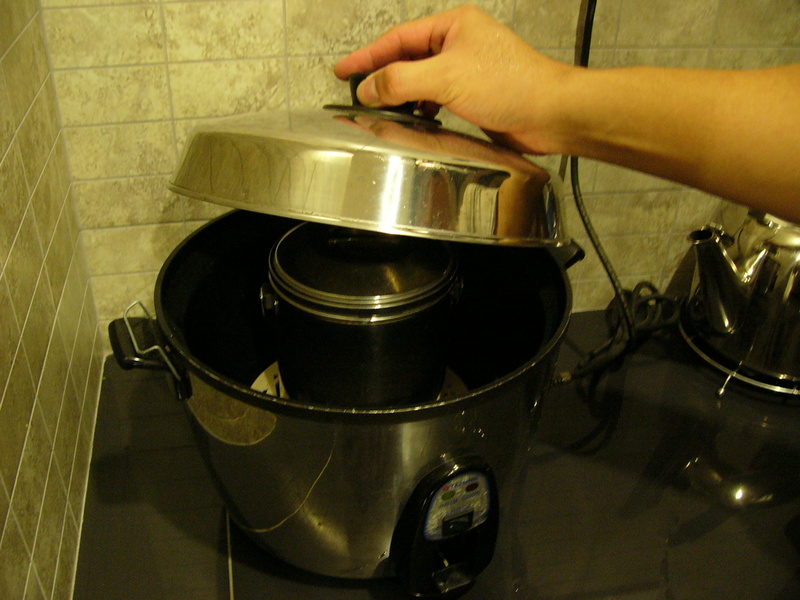 For step 10 “Keep the whole thing inside a rice “, do I need to swtich on the rice cooker? I have answered this Q before. Please read the other comments above. I have gone thru the Q&A few times but yet to find to answer to my question. Was it in chinese character? I am sorry I do not understand Chinese character. Try not to add sugar in your yogurt if you can help it. It will nullify the goodness of your yogurt. In fact, avoid sugar if you could. You may add freshly squeezed juice eg carrot, oranges etc or fresh fruits like mango, papaya or banana. thx joyful.i’ll try it.but not now.coz my new sem started ady~didnt hv enuf utensils.haiz…nid to drink packed yogurt. Soya cannot make yogurt, even the soyabean itself cannot eat together with milk, cheese and yogurt, these will effect the calcium intake. Try use Fresh Milk it taste better. 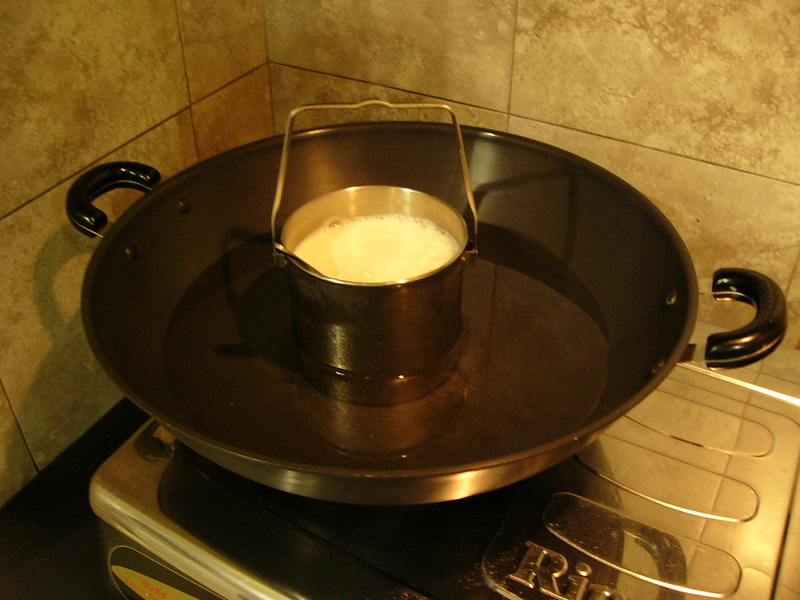 A Q from my 9-yr-old child: Why must use stainless steel pot? Can air-tight container (plastic) be used? Thanks. I am using s/steel bcos it is easier to heat up, you can transfer to other type of containers, but make sure those containers are clean. The link seemed to be on strike for a couple days. Finally, tonight I am able to see it. Hi, thanks so much for the recipe to make yogurt. I use Nestle yogurt to make. It is always successful and the taste is very good. Even my child says that it “tastes better than yogurt from the supermarket. slimy, runny, off taste, etc. What had gone wrong? Thanks. Another Q: if I add in more yogurt into the milk, what will happen? Presently, I use 2T of yogurt for 1/2 L of fresh milk. I know your recom. is 2T for 1L. I am a bit kiasu. So use more but would like to use less if possible. The fermentation process is very much depending on the temperature, duration & bacteria counts. So increase these parameters will speed up the fermentation process hence “harden” the end product. Since we are not doing it under stringent condition, the output may not be perfect all the time but who cares…. these are very healthy DIY yogurt. Wonder why those yogurts in the market taste so nice and look so consistence in terms of taste & appearance ? Don’t ask me. Those commercial yogurt last a long time sitting on the shelves too, without turning more and more sour. Think again, what method they use to control the good bacteria in it if there is still bacteria in it ?? Since I don’t know why by using homemade yogurt, it often doesn’t work, I now use only Nestle yogurt (our preferred taste). 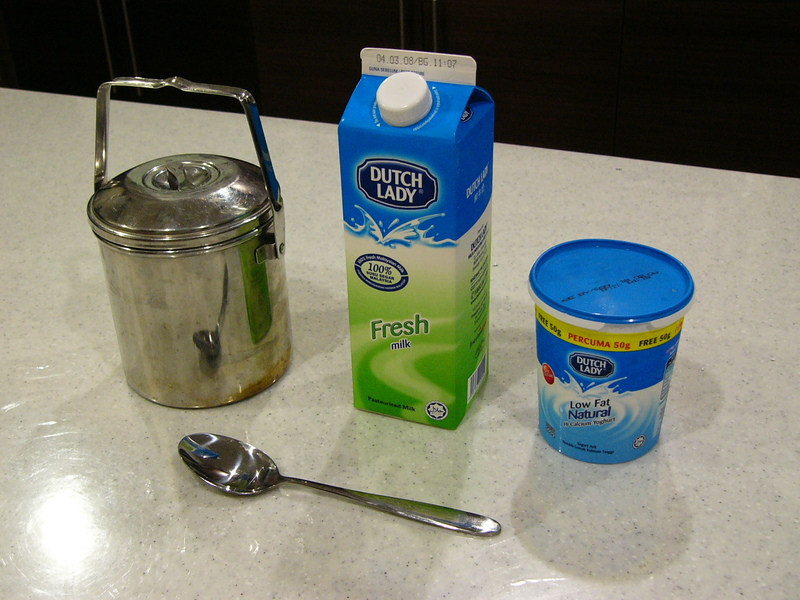 I use 80g of yogurt (2 big tablespoons) for 1 L of milk. So far it has always been successful. Most important of all, my vegetarian child likes it. Once she tried the former, she pleaded not to eat it anymore. So this vegetarian mummy would rather be safe than sorry. I stick with Nestle. Last night I had try diy my homemade yogurt following ur method, the result came out excellent, soft, smooth not sour and no milk taste. Thank you for sharing ur knowledge. I am glad you like it, it will eventually turn sour if fermentation process prolong. If you dun mind the sour taste, you can try to make some kefir as well. if she doesn’t ve a thermometer how does she estimate the temperature. my yogurt is a bid sticky and sour too. I still not ready to diy kefir yet. hmmm … if u can stand the milk smell of yogurt … why not kefir ??? 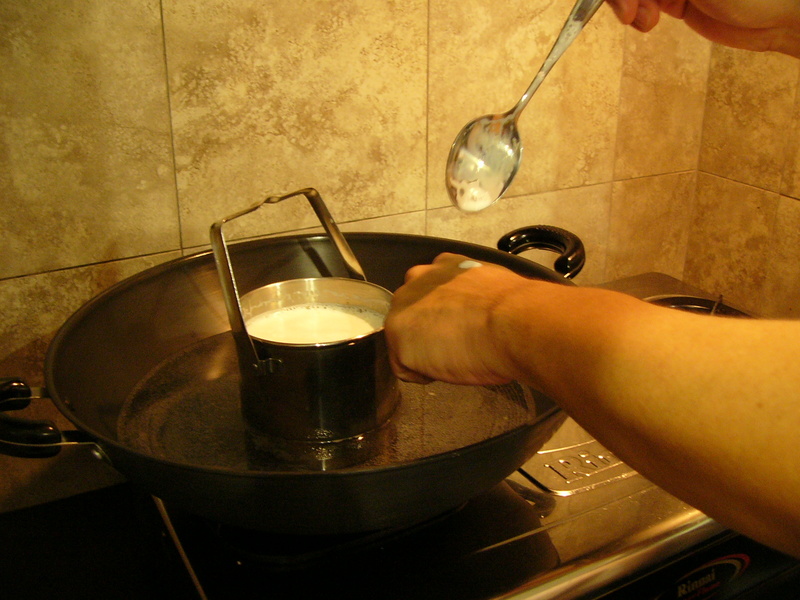 regarding to the temperature, tell your sister-in-law, she can drip some of the heated milk on her skin (like how to prepare feeding milk for a baby) as long as the temperature is comfortable on your skin, it is safe to stir in the yogurt. Thanks Thomas, I shall tell my sister-in-law how to do it. I would like to know the amount of consumption per day. I can eat the yogurt without adding any fruit or juice, right? What is the best time to consume it? Q : I wonder whether you can answer my question about yogurt. Can I blend the yogurt with the dregs of enzymes such as pineapple which contain sugar? I understand that any sugar contain stuff is not recommended to add into yogurt. My sis is always complaint about her bloating stomach, can her problem be solved by eating yogurt? Will I gain weight if consume too much yogurt? A bit worry about this. Thank you. A: Sure you can blend the enzyme residue or dregs with your yogurt. Do that only before you want to drink it. When I said not to add sugar to yogurt, I meant white sugar, or any form of sugar as consumption of sugar can cause multiple health problems. You need to investigate what causes bloating stomach. I can’t tell you just by one phrase description of the condition whether yogurt can help or not. Why don’t you go to the Tale of Kefir to read up some of the links I recommended there to find out more on the benefits of probiotics. You need to assess the other food you take daily to avoid weight gain, not just yogurt. And, how much is “too much”? Thank you for your reply, Joyful. “Too much” means 250ml daily. 250ml to me it’s not too much, it’s only 1 cup. If you are concern about the calories that may add on you, try to reduce the other high caloric food to balance up your daily calories intake. Can i use milk powder instead of fresh milk, coz i don”t have fridge, and 1 L fresh milk to too much for me. So, i m thinking is it possible by using milk powder? I use full cream milk powder most of the time. May not be perfect but it serve the purpose, it woks for me, you can try iy. You can try but the outcome is not that presentable. I have tried it, looks beautiful, it’s not so thick, but taste good. ^^ Phew… luckily..
why Keep 2 tbsp. of yogurt for next use in the fridge. (the next use is went? my baby 1y/11mth can eat yogurt? Use it as your “seeds” the next time you want to make yogurt. Baby can eat yogurt, of course read [this]. so,then mind next to make yogurt ,no need to wait for 隔夜发酵? now you confuse me, are we talking about the same topic? sorry,i first time to made yogurt. At first, i already found the Easiyo yogurt maker and placed the order already. Luckily, i found this websites, and realized that DIY yogurt is as easy as A,B,C… I tried it out yesterday night.. and yeah…. its really work. From now on, I can DIY yogurt for my baby. Thanks Thomas for sharing such a good recipe. Hope to receive the books from your sister soon. A lot ppl think fat are unhealthy, that’s why there are so many “low fat” food in the market now. Anyway, low fat plain yogurt can be an alternative if you really can find what you are looking for. hi, my yogurt ‘s colour turn out a little yellowish (like mangoes puddin) without whey, but it taste ok. is it normal? thanks!it is after a few batches of homemade yogurt. sorry, the colour is not as yellow as mangoes pudding, but it has no whey!! It is norml to have slightly yellowish color but not as yellow as mangoes pudding. If you leave the fermentation for too long it will become harder & sour with less whey like toufu, so harvest earlier next time if you want softer texture. I want to make yogurt with favour – like vanilla or chocolate. Do I add the favour with the yogurt ingredient before it become yogurt or after? Thank you. Is after. Anyway, by adding vanilla or chocolate you are turning the healthy yogurt back into unhealthy food which defeated the whole purpose, you can add some fresh fruits or fruit juice which is much healthier than any other artificial coloring/taste. 谢谢你的回答！我用“脱脂牛奶” 是因为它含较淡口味和想减肥，请问 脱脂和全脂牛奶 有何分别？ 冷牛奶一样也可制造吗? 谢谢! You have asked a very interesting question. If you are talking about homemade fruit enzyme making, I do not use stainless steel ware at all. I use glass bottles. If you are talking about yogurt making, I do not use stainless steel ware also. I use glassware. And, if you are talking about Kefir brewing, whether it’s water kefir or milk kefir, I definitely do not use stainless steel ware. I use glassware or glass bottles. Thomas 的 diy-recipe-index 里, 可供参考. I made 2L of raw milk yogurt the other day. After the curd has formed, I poured the yogurt into a cheese cloth pocket and let it drip for 12hrs in the fridge. What I collected was a tub of delicious, creamy Greek Yogurt. I served it with mango puree and fresh berries. Absolutely yummy and smooth. 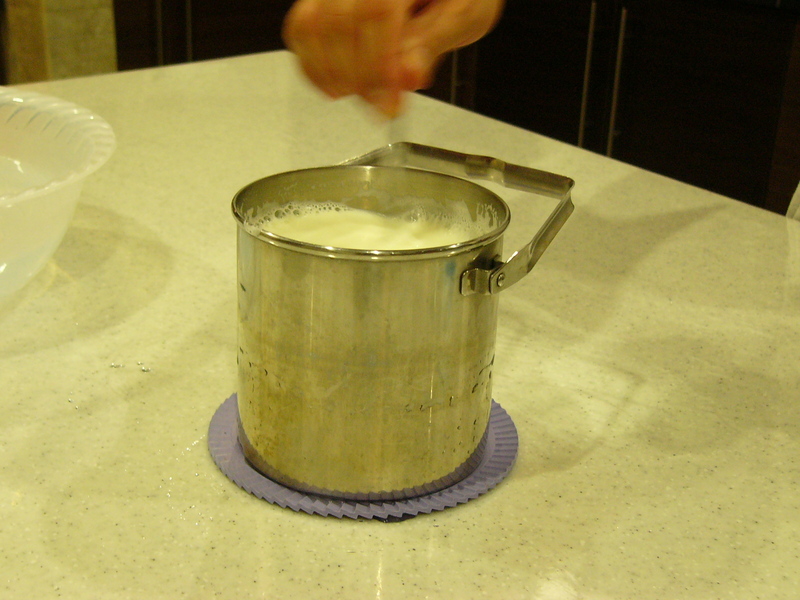 If you are brewing Milk Kefir, you may do likewise resulting in Kefir Cheese (like cream cheese). I kept the whey in a glass bottle and used it in juices and smoothies. 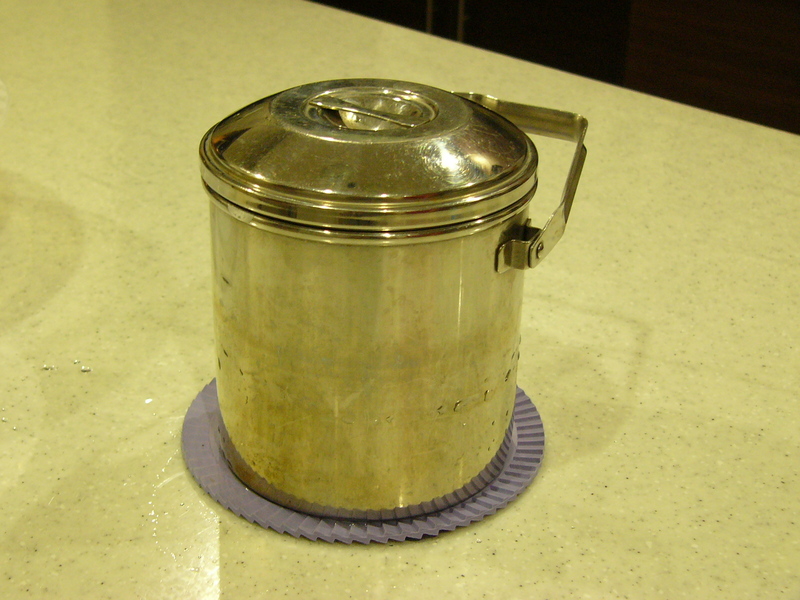 It can also be used in bread baking, soaking grains, beans, oat etc or for fermenting vegetable eg. Kimchi, Sauerkraut etc. You may also use whey as a face toner or cleanser. For hair care, after shampooing, follow with a whey rinse. Leave the whey on for 5-10 minutes, then rinse off with water. Half a cup of whey to a tub of warm water for foot soak is absolutely rejuvenating. how can i get “菌种”? Thx for the speedy reply!